Yes, that’s what it’s called. I’m not too creative when it comes to naming products. I try to be descriptive; sometimes I succeed. 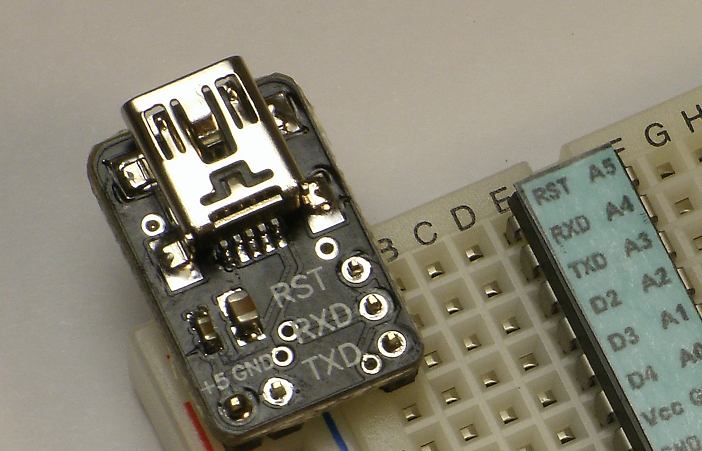 This is a minimalist USB-to-TTL adapter for use on a solderless breadboard. I designed this to use with my Breadboard Arduino class. It’s based on the FTDI USB UART chip, which is the same, identical chip used on “real” Arduinos, so it uses the same, identical drivers and works on most PCs. The only differences are that it is tiny, it plugs into a breadboard and lines up with the RESET, TXD and RXD pins of an ATmega328 chip (the Arduino main-brain) and it says “Dale Wheat’s USB to TTL” when you plug it in the first time. I make these here in the lab, by hand. Here is the schematic (PDF, EAGLE) and the PCB layout (EAGLE). I program each chip with a unique serial number to prevent COM port build-up. I use the MPROG 3.5 utility from FTDI with these settings. Originally I was only selling these USB-TTL adapters with the Breadboard Arduino kit, but due to popular demand, I am now selling it separately in my online store. You’re more than welcome, however, to make your own using the files provided above. The entire design is placed by me in the Public Domain. Go nuts. There have been some USB-TTL failures in the field from the very first batch of 100. These are being investigated to try to improve their reliability. Every disappointing and frustrating failure is an opportunity for improvement. If you are having problems with your USB-TTL adapter, please feel free to contact me to see what might be the matter with it. I expect machines and tools to perform their function without a lot of fuss. I’d also like people to use these little gizmos to build interesting and fascinating things and not have to spend lots of time trouble-shooting the components. Can the USB-TTL adapter be used in host mode? In other words, can I load USB host code into the arduino and plug a slave device into the ASB-TTL adapter? Unfortunately, no. 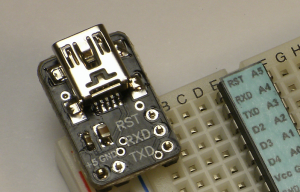 The FTDI FT232R device used on the USB-TTL adapter and the previous generations of Arduinos does not support host mode. It only acts as a USB device, and as far as I know, it cannot be reprogrammed to operate in host mode.